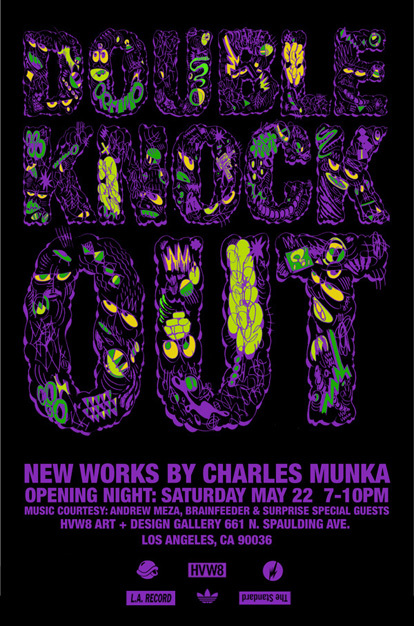 Join us opening night for "Double Knock Out", new works by Charles Munka at the HVW8 Art + Design Gallery in Los Angeles. This will be Munka's first US exhibition. DJ Sets by: Andrew Meza, Samiyam, Dibiase & Ras G + ? A member of the French art collective, LCP United, Munka's style is strongly influenced by hip-hop and the progressive L.A. beat scene. While various elements of popular culture have led the human species down a blind alley, there arise moments of personal escape and reflection through the jungles of the mind. Spanning multiple continents and absorbing the raw data of his surroundings, Charles Munka presents his latest series of work in a combination of past influences and current locales. Angry faces, pop references, and ancient symbols connect under the colorful wiring board of each mind map. As each piece seems to encourage a different freedom of association, the patterns of symbols throughout the series reinforce each other into an immediate and colorful experience of the whole. He was first widely recognized for his 'Finest Elements' pieces, a series of animated representations of artists such as MF DOOM, Madlib, J Dilla, Flying Lotus and RZA, among other notable producers and MCs. Munka has toured extensively throughout Asia, America and Europe creating his art live at Brainfeeder events and most recently, during Samiyam gigs in Korea and Shanghai. Munka is currently coming off of an extremely successful art show in Kanazawa, Japan with Los Angeles based producer/artist, Teebs. The two displayed and collaborated on several pieces for the event, many of which are now in private collections. Andrew Meza partnered with Charles Munka in 2005, leading to Munka's roots being planted in the progressive electronic/hip-hop movement. Subsequently becoming one of the most recognized and influential in the art/music world.